Expectant mothers have many things on their minds when it comes to the growth and development of their babies. When a baby is born, new concerns arise as mothers want to provide the best of everything to this tiny, new person who has stolen their hearts. Protecting their children from harm, is one of the greatest priorities of any good mother, and women who are breastfeeding are often overly aware that their milk has a direct effect on their baby. Women who are breastfeeding and need dental treatment are often concerned that it will affect their ability to breastfeed or that medications used will affect the quality and safety of their milk. At Gold Hill Dentistry, we want to help clarify guidelines for mothers who are breastfeeding full term, healthy babies. Most medications used during dental treatments are considered compatible with breastfeeding. Local anesthesia – this numbing medication is administered directly in the location that requires care. It is given in a small amount to localize the effect of the medication. Such a small dosage is very unlikely to pass on into a mother’s milk supply. If any does pass, it will be greatly diluted in a very short amount of time, and will have no effect on the baby. General anesthesia – general anesthesia does pass into the blood stream, but it is a carefully controlled substance. Administered according to a person’s weight, amounts given are compatible to each person specifically. Once a person is taken off general anesthesia, the affects wear off quickly. Generally, by the time a mother is awake and cognizant enough to hold her baby, the amount of medication in her system is low enough that it will not affect her breast milk. Nitrous Oxide (laughing gas) – commonly used as an oral sedation, nitrous oxide is virtually insoluble in the blood stream. This inhaled substance goes from the mouth and nose, to the brain, to the lungs, and then expelled to the air in the room. The rapid elimination of this medication makes it highly unlikely that any will cross into a mother’s milk. X-rays – while not a medication, many breastfeeding women worry about radiation affecting their milk supply. During X-rays, a lead apron is lain across the body for protection. During dental X-rays, radiation exposure is quite low and the breasts are fully protected. At Gold Hill Dentistry, we respect breastfeeding mothers’ concerns. Please speak with us openly about any concerns that you may have before treatment. There is also an InfantRisk Center that provides a hotline for questions regarding medications taken or administered while pregnant or nursing. The number is (806) 352-2519 and we encourage you to call them if you would like more clarification. 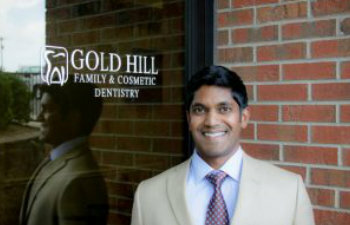 The entire staff at Gold Hill Dentistry looks forward to serving you and providing the expert care you deserve.